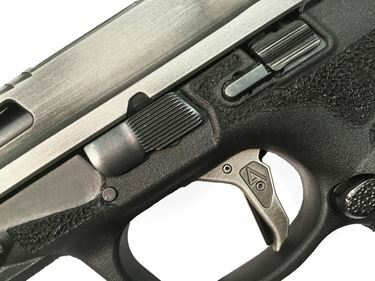 A Hand Fitted trigger from Agency Arms, finds its self among the best in the market... By hand fitting the trigger, to the end users weapon, the overall feel is dramatically improved. The benefits can be felt in the following areas: The trigger pull starts with very little take-up, as the shooter quickly finds the “break point”, and is greeted with a crisp, audible, break. With the minimization of any over travel and a snappy reset, the result is a very gratifying trigger pull, for faster follow up shots, and tighter groups. Take up/slack – The movement of the trigger with little or no weight before there is any movement of the sear. This is longer on many new polymer pistols because of the trigger face safeties. Break – The movement and increase in weight associated pressing the trigger with enough force to release the sear and fire the gun.